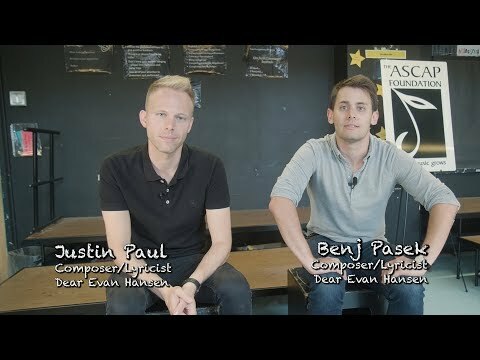 Join Pasek & Paul in their support of a unique learning experience for youth! For most kids, ‘Broadway’ is just the name of a street in Manhattan, not where you can find the world’s greatest musical theatre shows. But even for those who do know about Broadway theatre, ticket prices and transportation issues make this art form almost impossible to access for those of lower economic means. You can help. Your donation will make the arts more accessible to youngsters who wouldn't otherwise be able to experience it directly. Our one-of-a-kind ASCAP Foundation Children Will Listen program introduces the American Musical Theatre to public school kids, teaching disadvantaged youth how theatre stories can relate to them and how theatre production is a potential career path. Your support will help unlock the future of musical theatre. Future artists. Future audiences. Each year, a public school is identified and a Broadway show is chosen as the program's focus. Classroom materials are provided to the teachers and a member of the show’s creative team conducts a class with the students. A week or so later, all of the kids are brought by chartered bus to a world-class musical theatre, each with a Broadway ticket in their hand. Immediately following the performance, and as the rest of the public is exiting, the children are moved to the front of the theatre for a fantastic private Q&A session with the stars and creative team of the show. This past fall, with the help of award-winning writers Benj Pasek and Justin Paul, 45 students from a Bed Stuy public middle school in Brooklyn, NY, learned about musical theatre through the Broadway show, Dear Evan Hansen. To date, the Children Will Listen program has introduced the facets of musical theatre production to thousands of economically disadvantaged children nationwide with programs taking place in Washington, D.C., NYC, Dallas, TX and Los Angeles, CA. Past award-winning guest artists include Lin Manuel-Miranda (of Hamilton), Stephen Schwartz (of Wicked), Lynn Ahrens and Stephen Flaherty (of Ragtime) and Charles Strouse (of Annie) among others. Many participants describe the experience as truly life-changing. “My students and I cannot thank The ASCAP Foundation enough for our experience seeing Dear Evan Hansen… Not only did the students learn to have empathy for one another through this story, but they saw themselves within the characters on stage, which provided the perfect gateway theatre experience… If not for this organization, many of these children may never have set foot in a Broadway theatre,” said Jennifer DeRosa, drama teacher, M.S. 57 in Bed Stuy, Brooklyn, NY. Established in 2005, The ASCAP Foundation Children Will Listen program was created to honor Stephen Sondheim. The program was named for one of the songs from his musical, Into the Woods. Make a donation today and make musical theatre more accessible to youngsters who wouldn't otherwise be able to experience it. This year's program won't be possible without your support.